It’s a brand new month which means it’s time for DCWV’s Stack-A-Holic Sketch Challenge. Yippee! Erin has picked a fabulous sketch this month. This sketch gives you the opportunity to use several stripes of paper,so I picked my favorites out of the Animal Crackers Stack and got to work. I adore the animals in this stack and tried to include them all. The sketch also allowed for a multi word title, so I used both the Pop-up Saying Embellishments and Rub-ons to complete mine. I love the varied dimension I got by using the different elements. As you can see Hartly was a little overwhelmed on the Jungle Safari ride at Walt Disney’s Animal Kingdom. But don’t worry, the hands over the eyes only lasted for a minute and then it was hands thrown up in the air with squeals of delight while her father and I held on to her with all our might. I hope you’ll join in this month’s challenge. 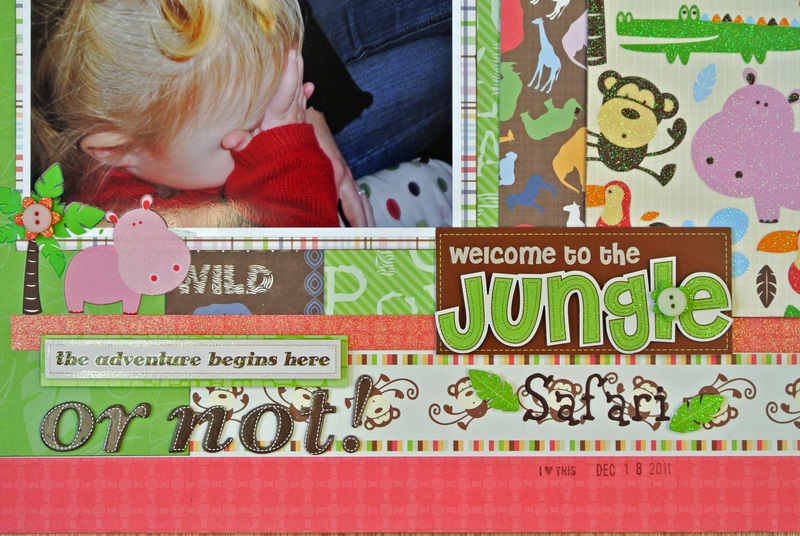 Love the combination of animal papers! Glad to hear Hartly had a great time!